India, with its huge population and developing economy is a vast global market for almost everything, and is certainly one of the largest markets for mobile phones. The mobile market in India is humongous and also greatly diverse, where one can find all sorts of models as per one’s needs, references and pocket strength. You can definitely get all the latest global premium flagship mobile handsets here, while also get your hands on the most basic handset that has well become obsolete elsewhere. Interestingly all the three segments – premium, mid-ranged and budget of the mobile market are fast growing in India, and there are innumerable mobile makers both homegrown and global fighting with each other in this space. India is definitely one of the hottest smartphone hubs in the entire world, and the increasingly competitive market thus, gets flooded with great models all the time. The incredible demands in the Indian mobile market makes the mobile manufacturers churn out multiple similar products which not only spoil a buyer with innumerable choices no matter how small his budget, but also manages to make one completely perplex while finally zeroing down on a particular model. The budget smartphone offerings – namely the Xiaomi Redmi Note Prime and the Lenovo K3 Note are just two such models that offer good features with a very attractive price. Here is a very specific as well as concise comparison between the Xiaomi Redmi Note Prime and the Lenovo K3 Note for all those who are eyeing these two models in the budget mobile segment of India. The Redmi Note Prime is a good looking mobile phone that comes along with a large and vibrant 5.5 inch High Definition IPS display with a screen resolution of 720 x 1280 pixels. The K3 Note also comes packed with a 5.5 inch touchscreen display. However it gets a better screen resolution of 1080 x 1920 pixels with 401 ppi. Thus, its display is also supposed to be crisper and clearer. The Redmi Note Prime measures 154 mm x 78.7 mm x 9.4 mm and weighs 185 grams, while the K3 Note’s dimensions are 152.60 mm x 76.20 mm x 8.00 mm and has a weight of 150.00 grams. Thus, among the two the Lenovo K3 Note is the sleeker and also the lighter one, which means easy, less stressful handling on a daily basis. 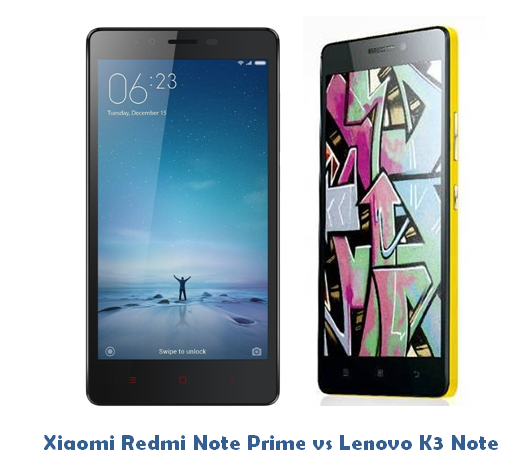 In the design and display departments thus, the K3 Note is the winner among the two compared here. The Chinese affordable offering, the Xiaomi Redmi Note Prime utilizes the Android version 4.4, KitKat which is topped with the UI MIUI 7. On the other hand the Lenovo K3 Note runs on the newer Android version 5.0 Lollipop that is topped with Vibe UI. In this aspect, thus the K3 Note is better owing to the Android Lollipop which offers better conveniences. The Redmi Note Prime gets powered by a quad core Qualcomm Snapdragon 410 chipset that is clocked at the speed of 1.2 GHz, while the K3 Note gets an Octa core MediaTek processor that ticks at 1.7 GHz. Both the mobile handsets get the support of 2 GB of RAM. Here performance-wise both are expected to offer the same kind of experience, although the K3 Note could be slightly faster. In terms of storage and connectivity, both the models are similar and are absolutely equal. The Redmi Note Prime comes with the inbuilt storage space of 16 GB that can be increased with the help of a microSD card to up to 32 GB. The K3 Note also gets internal memory of 16 GB along with microSD expandability to up to 32 GB. Both the Redmi Note Prime and K3 Note are dual SIM models and both the phones come with all the latest standard connectivity options 3G, 4G, GPRS/ EDGE, Wi-Fi with hotspot, Bluetooth, Micro-USB, FM radio, GPS/ A-GPS, etc. The Xiaomi Redmi Note Prime comes flaunting a good 13 megapixel primary camera at its rear which comes with the crucial features of autofocus and LED flash and offers good pictures all the time. The mobile also offers a standard 5 megapixel front facing selfie snapper to offer ample of pleasure to the selfie lovers. The Lenovo K3 Note also features the same specs as far as the camera department is concerned. It also gets a 13 MP primary rear shooter along with flash, while there is a 5 MP Selfie snapper as well. In terms of camera, both the mobile handsets offer the same sort of capabilities. When battery life is concerned, the Redmi Note Prime draws its juice from a 3100 mAh battery pack and can offer a whole day of good work as well as play. On the other hand, the K3 Note comes packed with a smaller 2900 mAh battery pack that also offers good backup. However, as the K3 Note has a better screen resolution as well as a smaller battery in comparison with the Redmi Note Prime, and thus it is expected to offer less battery life than its market rival. The Xiaomi Redmi Note Prime will be available at a price of Rs. 7,999 in the Indian market. On the other hand, the Lenovo K3 Note will be offered at a price point of Rs. 8,999. On the whole the Lenovo K3 Note seems to be a better deal with a better screen resolution, sleeker and lighter design, Android Lollipop all going in its favor. However, it is slightly more expensive than its capable rival, the Xiaomi Redmi Note Prime that comes with better battery life. However, if the difference of a good one thousand matters for your pocket and if you really don’t care about the specs difference, then the Redmi Note Prime is a very attractive choice as well. The final decision of course lies with the buyer.